Like the runaway train in that Denzel Washington flick, these North American railroad operators seem unstoppable. CSX (NYS: CSX) coasted through the effects of a severely impaired domestic coal market to deliver first-quarter earnings of $449 million on nearly $3 billion in revenue. After joining rivals Union Pacific (NYS: UNP) and Norfolk Southern (NYS: NSC) in noteworthy campaigns to repurchase shares last year, the benefit to shareholders shines through in CSX's 23% increase in earnings per share on a nominal increase of just 14% in net profit. Following smaller operator Genesee & Wyoming's (NYS: GWR) troubling report of a 42.7% year-over-year reduction in coal volumes for the month of March, the 14% drop in volume noted by CSX for the first quarter offers investors a more representative snapshot of the state of domestic coal demand. While domestic thermal coal demand for use by utilities remains quite depressed -- following a warm winter and extremely low prices for natural gas -- CSX noted strong domestic demand for metallurgical coal and export demand for thermal coal as significant mitigating factors. Meanwhile, remarkable strength from domestic intermodal demand yielded a 19% increase in related revenue on a 9% surge in volume. Reflecting a long-standing trend that has sparked much of the resilient strength in the performance of railroads through this lasting economic downturn, CSX noted the movement of container traffic from the roads to the rails as domestic volume grew to a virtually even split with international volume. Speaking of long-standing trends, I remind those investors who may be turning a cold shoulder to railroad stocks in response to the coal-market malaise of two important facts. First, while the recent downturn in coal demand is substantial, it occurs within the backdrop of a long-term global supercycle that major producer Peabody Energy (NYS: BTU) recently confirmed is "alive and well." Second, as the following 10-year chart will confirm, the trailing performance of railroad stocks over the past decade has been nothing short of phenomenal. I submit that it would take far more than a touch of trouble for coal to reverse that broader trend. CSX shares have appreciated by nearly 300% over the trailing decade, steamrolling a corresponding 65% advance for the S&P 500! Combining attractive dividend yields with a proven commitment to shareholder value in the form of those aggressive share repurchases, I continue to view the North American railroads as superb long-term investment vehicles. Add CSX to My Watchlist. 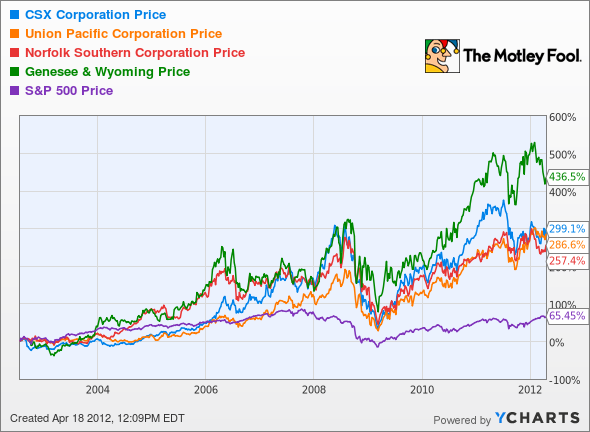 Add Union Pacific to My Watchlist. Add Norfolk Southern to My Watchlist. Add Peabody Energy to My Watchlist. Add Genesee & Wyoming to My Watchlist. At the time this article was published Fool contributor Christopher Barker can be found blogging actively and acting Foolishly within the CAPS community under the username TMFSinchiruna. He tweets. Motley Fool newsletter services have recommended buying shares of Genesee & Wyoming. The Motley Fool has a disclosure policy. We Fools may not all hold the same opinions, but we all believe that considering a diverse range of insights makes us better investors. Try any of our Foolish newsletter services free for 30 days.